New York State is offering $100,000 reward for the capture of prisoners. Two residents in the upstate New York town where a pair of convicted murderers escaped said they're "lucky to be alive" after spotting what they say were the fugitives a short time after they made their getaway. "Lucky to be alive, man," the woman told ABC News today. The man and his friend were returning home around 12:30 a.m. when they spotted two men, who they say are fugitives Richard Matt and David Sweat, in their backyard with what appeared to be a guitar case. When he confronted them at the home, which was near the manhole that the prisoners used to escape, one of the men responded "We're just lost. We don't know where we are. We're on the wrong street," according to the witness. After that, they took off running, said the witness, whose name is being withheld due to safety concerns. Later that morning, they reported what they saw to police, who started their search in the backyard. Police dogs were able to follow the trail but did not get far. The account came as a prison worker was questioned by police and removed from her post amid the investigation, a source close to the investigation told ABC News. Matt and Sweat remain on the run after escaping Saturday from Clinton Correctional Facility in Dannemora, about 20 miles south of the Canadian border. "These are dangerous men," Cuomo said, adding that they are "capable of committing grave crimes once again." News of the unidentified worker being questioned in the prisoners’ escape was first reported by the New York Post. 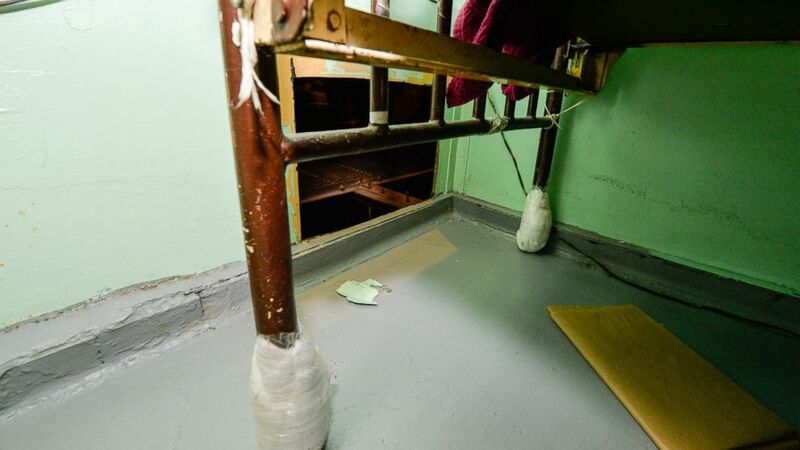 (Darren McGee/New York State Governor's Office, via AP) This photo provided by New York State Governor's office shows the area where two convicted murderers used power tools to cut through steel pipes at a maximum-security prison in Dannemora, NY, near the Canadian border and escaped through a manhole, New York Gov. Andrew Cuomo said Saturday, June 6, 2015. Sweat, 34, is serving a life sentence after he was convicted of killing a Broome County sheriff's deputy in 2002. Matt, 48, is serving 25 years to life in prison after he kidnapped and beat a man to death in 1997. "These are killers. They are murderers," Cuomo said. "There's never been a question about the crimes they committed. They are now on the loose, and our first order of business is apprehending them." (Gabe Dickens/Press-Republican via AP Photo) Law enforcement officers with bloodhounds stand guard at one of the entrances to the Clinton Correctional Facility in Dannemora, N.Y. on Saturday, June 6, 2015. Speaking to ABC News Sunday, Cuomo said what troubled him most about the escape was that the two men needed power tools to pull it off, and there was no way they could have done it in total secrecy. "They had to be heard," he said. The governor, who toured the prison Saturday, described the escaped convicts as "resourceful" and "dangerous." (Darren McGee/New York State Governor's Office, via AP) This photo provided by New York State Governor's office shows the note left by two convicted murderers who used power tools to cut through steel pipes at a maximum-security prison in Dannemora, NY, near the Canadian border and escaped through a manhole, New York Gov. Andrew Cuomo said Saturday, June 6, 2015. "This was the first breakout since 1865 and I want to make sure that it's the last," Cuomo said, referring to the year the prison was built. 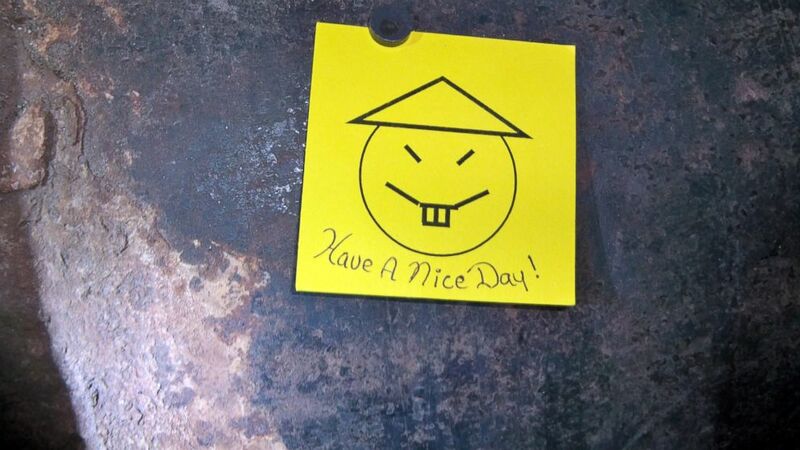 The escapees left a note behind that read "have a nice day." Cuomo said he suspects it was their way of saying they were doing something that had never been done before. "I'm sure they knew that since it was the first escape it was going to be a big deal," he said. "But we'll get them back and we'll give them the note back." Editor’s Note: The story has been updated to reflect that the resident quoted in the piece who wished to remain anonymous is a woman.